Turkey’s stock as a Western ally is plummeting. Ankara stubbornly resists joining the coalition unless it broadens its fight to topple Syria’s Bashar al-Assad. Turkey’s 200 or more F-16 fighter jets sit idle as the Islamic State makes alarming gains across Syria and Iraq. This stands in sharp contrast to other Muslim world allies – including Saudi Arabia, Bahrain, the United Arab Emirates, Qatar and even Jordan – that have taken part in the aerial campaign against the Islamic State. Turkey’s absence is conspicuous. It’s the only NATO ally among these Muslim world partners. To be clear, the fight against the Islamic State is not a NATO mission, but it serves as a reminder of how little Erdogan’s regime has done to help preserve order in the Middle East. If Turkish support comes at the price of having to fight both sides in Syria, the price is far too high. It is understandable that the Turkish government doesn’t want to bear the brunt of a ground war in Syria, since there has long been strong opposition in Turkey to the government’s Syria policy and even greater opposition to Turkish involvement in the war, so the administration would be wise not to expect a large Turkish commitment to the war in any case. Turkey is trying to use the war against ISIS to keep pursuing the misguided goal of regime change in Syria that it has pursued for the last three years without success, and the U.S. would be irresponsible to indulge them in this any more than it already has. Here is what makes buffer zones, or safe zones, or humanitarian corridors so dangerous: once you have American/British/French/Turkish troops occupying a little sliver of Syria that’s surrounded by ISIS or by Assad forces, it’s all but inevitable that those troops will come under attack. The war in Syria is deeply chaotic and the factions disorganized; it would only be a matter of time. Open fighting between the foreign occupation forces and ISIS or Assad forces could spiral out of control all-too-easily, possibly leading to all-out war. The odds are just very low that we could put American (or British or French or Turkish) troops in the middle of the Syrian civil war and somehow keep the mission contained to protecting a tiny buffer zone. This may well be why the Pentagon is saying that the buffer zone option is not “on the table.” The exposure to risk and to mission creep is likely just too high. 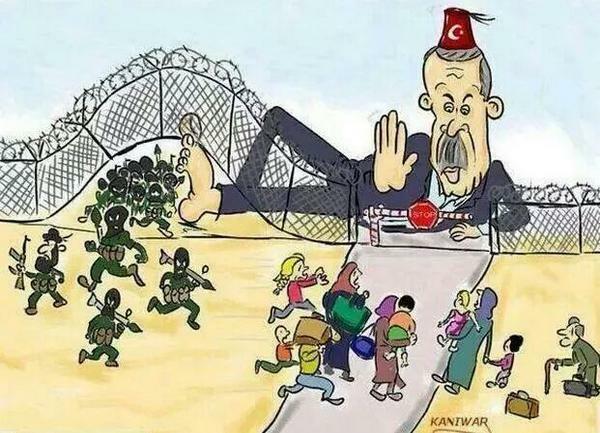 By prioritizing the removal of Mr. Assad and expending a huge amount of political capital to convince its partners of the necessity of regime change, Ankara is also losing an opportunity to mobilize international support for its ballooning refugee crisis. Turkey is now host to more than 1.4 million Syrian refugees, with government spending reaching $3.5 billion. Just a week ago, 138,000 Syrian Kurds sought refuge in Turkey, a number surpassing the total number of Syrian refugees accepted by the 28 European Union member states since the beginning of the conflict in 2011. Yet despite the growing social and material cost of hosting the refugees, Turkey has been unable to mobilize international support for a more equitable sharing of the refugee crisis burden.